Being a witch is something you are, not something you believe. A witch Sees with her eyes, her skin, her mind and her heart. She watches and guards the boundaries, between light & dark, night & day, life & death, right & wrong. She is rooted in the earth, its bones are her bones, and it sings in her blood. She is insatiably curious, and never stops learning what the world is teaching. She does no harm. She serves kith & kin & stranger because she is called to, by Love. On the up side, if you're me, you have a demented sense of humor, a great appreciation for men, multitudinous cats, and a pet stuffed bat. I am body mother to one equally demented child, and clan mother to a whole passle of kids and grandkids. Life's kicked me around, but I'm still smiling. 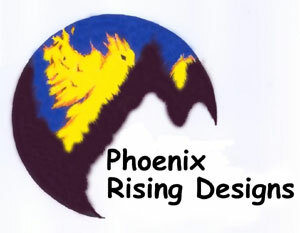 I make jewelry as Phoenix Rising Designs, and essential oil products as The Clanmother's Stillroom, which I hope to be taking online in the near future. I make great quiche, cheesecakes to die for and pretty mean veal parmesan. My starter webpage is The Clanhold. Initially, that will redirect you to the MySpace page where I'll be selling my jewelry soon. When I've got enough cash built up to go to full service online stores, that will be the parent page. You Call This a Blizzard? Building an Ethical System -or- You Mean I Have to THINK?! So Who Gets to Decide What's "Moral"?